Hapag-Lloyd Cruises has introduced its 2015-2016 Hanseatic expedition cruise brochure, offering eleven adventurous and enriching itineraries in English on board the world’s only 5-star* expedition ship. 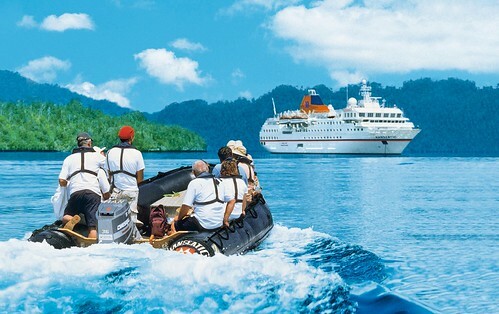 From 2015/16 Hapag-Lloyd Cruises will offer international expedition cruises on the Hanseatic, while fleetmate Bremen will be marketed in the German-speaking market. Bremen will still but will be available for English-language charters however. In 2015-2016 the Hanseatic will travel to Antarctica, Chile, Greenland, the Arctic and the Amazon, with voyages ranging from 15 to 20 days. All cruises will be operated in English, ensuring UK, Irish, North American, Caribbean and Australasian passengers feel comfortable from the moment they step on board. All documentation will be in English and the crew are fluent in English. Daily programs, menus, lectures, announcements and Zodiac tours will all be available in English, and English shore excursions can also be arranged at ports of call, just as in the past. The 5-star* Hanseatic was built to provide intensive exploration in the most elegant surroundings for a maximum of 175 guests. The design of the ship – with a low draught of just 16 feet, overall length of 403 feet, and the highest ice class for passenger ships allow Hanseatic to travel to destinations previously inaccessible to cruise ships. An intensive expedition between the shores of Iceland to Greenland’s wild fjords and mountainous coastline. Guests can view captivating colonies of birds and diverse plant species; call at informative museums while ashore in Greenland, enjoy natural history walks and see the impressive show of gigantic, towering ice masses in Disko Bay. Both expedition ships Hanseatic and Bremen are well equipped for travel in difficult waters, holding the highest Ice Class ranking for passenger vessels (E4 or 1A Super). Shallow drafts and high manoeuvrability allow the ships to enter waters larger cruise vessels cannot. Guests explore the world’s best-kept secrets in Zodiacs with only 10-12 guests. On board experts include a team of experienced scientists, expedition leaders and specialists who guide landings and offer guests the rare opportunity to observe plant and animal life up close. However, what makes these expedition adventures standout for guests is the security of knowing that highly experienced captains are guiding the vessels and have together already travelled to the Arctic and Antarctica more than 200 times. For more information on Hapag-Lloyd Cruises’ exciting destinations and itineraries please call Gay Scruton at The Cruise People Ltd in London or e-mail cruise@cruisepeople.co.uk to request a copy of the 2015-16 brochure.